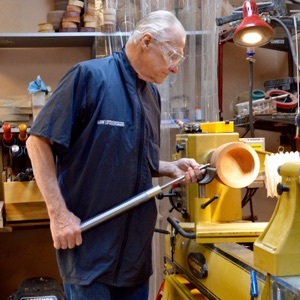 We love sharing the stories behind the unique products we've sourced from skilled artisans and makers; one of our most recent additions is handcrafted Yarn Bowls from woodworker Dave Yocom. Each bowl is on-of-a-kind and made from all natural woods. There are no dyes or stains used in making the bowls, allowing the wood grains to show off their natural beauty. We recently took a few moments to chat with Dave to learn more about the story behind this distinctive item. 1. How did you get started woodworking? I actually started in Junior High School and learned to really love working on a lathe. I was not able to continue that love until 16 years ago and thats when the lathe work became a passion. Turning a plain looking piece of wood and seeing the patterns and wood grains show up is exhilarating. 2. What was the creation process like for the yarn bowls? Are you a knitter or crocheter yourself? My wife, a spinner and knitter, got me started making Yarn Bowls. We were at the Oregon Flock and Fiber Festival in Canby, OR and she dragged me over to a friend's booth picked up a yarn bowl and handed it to me and said “you can make these.” So I started making the yarn bowls making some enhancements and adding my own flair to the bowls. 3. How long does it take you to make one bowl? This is a question I get asked all the time, there is no easy answer. I can turn and finish a simple bowl in 30 minutes, however, I then have to cut the “J”, and and apply another finish. The more complex bowls take much longer to glue up and let dry before turning. 4. Where do you source materials? Do you have a preferred wood or material? The easy answer to this question is “anywhere I can”. I have several friends that give me wood from their property, the rest I purchase from local suppliers. I do not really have a preferred wood as I really enjoy seeing the different wood grains POP out at me. We look forward to sharing more artisan spotlights with you in the future. Thanks for joining us!